The objects in our artificial environment are created by design and implementation. In other words, they are the result of a top-down material organisation process. A new structure is introduced into an existing fabric, and must adjust to the global laws of the system already present. It must fit into its local environment as well as conforming to the elements that comprise its own structure. While traditionally the building units of such an object are organised in space using drawings, today this process of materialisation is increasingly regulated by digital information1 , which makes possible the emergence of objects built on much more complex systems of rules. Changes in our society, and our cultural predisposition and receptivity are closely linked with the achievements and dominant views of science, together with their unavoidable influence on architectural innovations and trends. This was also the case with the appearance of computers and computer science. The emergence of digital technologies marks the end of (1) normative architectural design2 . The initial use of computers as tools of representation and documentation led designers to process-oriented, (2) generative design practice, and then to (3) design techniques modelling adaptive, dynamic systems. Although scientific progress inspires and aids designers both on a material (geometrical and physical) and a theoretical (conceptual) level, the majority of the envisaged objects only exist in virtual space or in the form of table-top models, and the theory behind new design techniques is rather unacademic. Computer-aided design, however, provides architecture not only with a new tool, but also a new opportunity to rethink itself in a new context. In a traditional scenario, during the design phase an idea or a final solution for the design problem surfaces in the designer’s mind; though impressively multi-faceted and broad, this is also limited. The information produced about this then serves to describe the physical and spatial appearance – or to use a biological analogy, phenotype – of the object. This type of material organisation is an exclusively top-down process, at the end point of which a physically stable, passive condition and a specific entity comes into being. In this organisational model, the relationship of the parts (building units) and the development of details can only be determined within full knowledge of the whole. First, a concept pertaining to the whole of the building is formulated in the designer’s mind, and then the interrelationship and spatial positioning of the components unfold during the design process. This is what we refer to as a normative design process in current architectural practice. For representation at the physical level, designers have axiom-based Euclidean geometry at their disposal for the preparation of the graphic information – plans, sections and elevations – required for project implementation. The applied building units, the technologies and the geometry required for delineation all result in forms consisting of planar elements. On a theoretical level, the process of normative design is most similar to classical Newtonian science. Depending on the initial condition, by applying the given rules the outcome of events can be calculated; chance has no role in such a system. The world works according to a kind of cosmic clockwork. This mechanistic worldview allows not only for the prediction of the future – the materialisation of the object to be designed – but also for the precise unravelling of past events: the function to be filled. This is a mechanism of necessity, which produces the appropriate solution for a given demand. Experiments and theories of thermodynamics in the early nineteenth century did much to undermine this mechanistic perspective. Then at the beginning of the twentieth century Einstein helped us see that this cosmic mechanism was not at all what we had imagined – in fact what it was really like depended on where you stood within it. It still worked deterministically (like clockwork), but the theory of necessity gave way to the theory of a mechanism of possibilities which did not yield a single outcome, but continuously generated new results. With the help of computers and digital codes, machines performing increasingly complex operations can be modelled. Although the processes that take place inside these are still deterministic, it would take a considerable length time – or it would be impossible – to calculate the temporally changing results without a computer. The design practice which instead of supplying a single solution for a problem produces a method or procedure that is capable of generating an infinite number of solutions runs counter to the traditional approach. These methods – regardless of whether the designer uses an analogue or digital technique – are rule-based processes that create temporally changing, complex structures. Spatial units – such as a plastic cup or even a folded paper shape – can replace planar elements which create three-dimensional structures in accordance with a sequence of rules we have invented. The photographs, which were taken at the FAB-RIC workshop organised for the students of MOME4 , show examples of this. 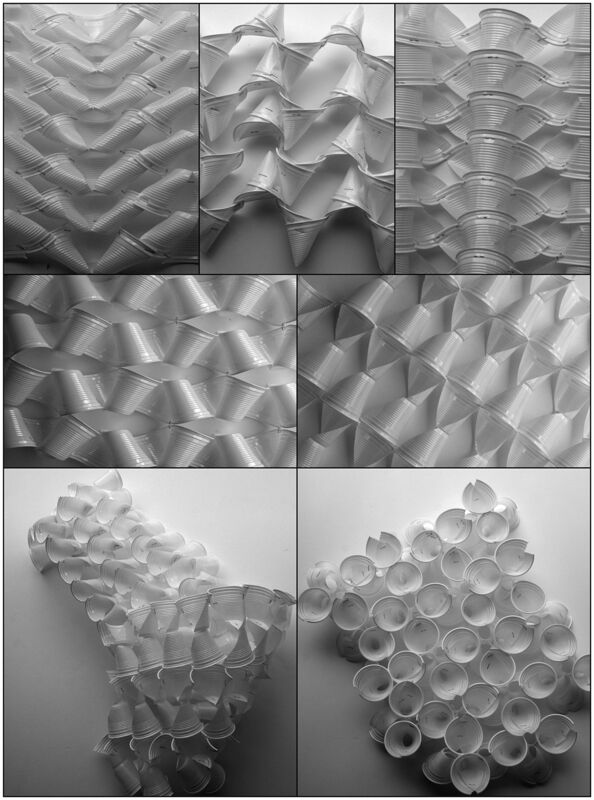 As a first step towards creating physical algorithm-based systems, students manipulated the shape of plastic cups by cutting, folding and twisting. Then, using metal staples, they created simple patterns followed by complicated three-dimensional shapes. The construction of structures is influenced not only by the rules of sequencing and linking between individual components, but also by the laws of physics and the quality of the building units’ material. Figure 1. Patterns and forms of transformed plastic cups generated by students of FAB-RIC Workshop, MOME, Budapest, 2007. Figure 2. 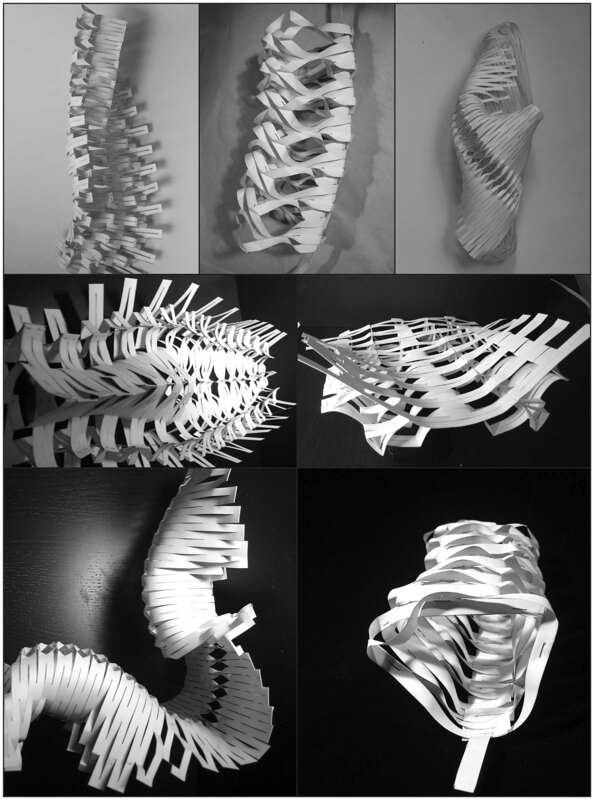 Cutted, folded, stapled forms created out of a single sheet of paper. Models of Enikő Márton. While descriptions of hyperbolic geometry had already appeared – linked to such names as János Bolyai, Nikolai Ivanovich Lobachevsky and Karl Friedrich Gauss – at the beginning of the nineteenth century as a first step towards the calculability of non-Euclidean geometries and topologic surfaces, the precise description and representation of these in design was not possible prior to the emergence of three-dimensional computer modelling. The use of digital modelling software not only simplified the use of curved surfaces in architectural design, but also made possible the transformation of modelled forms – without interrupting the continuity of the material. Taking advantage of the time-dependent manipulability of flexible surfaces which can be modelled by animation software and which retain their topological, spatial continuity, the architect Greg Lynn experiments with the transformation of various shapes in virtual space – or, in his words, animates forms.7 The surface points of topological shapes can be calculated using vectors, thus making the spatial shifting of a single surface point possible; however, this also means displacing adjacent points, all the while retaining the continuity of the surface. These transformations generate new shapes by application of the rules – the series of steps – established by the designer to answer the specific design problem. Macro-level techniques relating to the whole shape and micro-level procedures transforming the shape’s constituent units can both be employed. While in the former case the transformation results in an alteration of the parameters of the individual surface points, in the latter case it changes the specifications of the structural components. If what we are altering is not the form itself – as when using animation software, for example – but generating new form by altering the elements that comprise it, we are talking about parametric design. As parametric design is associated with the use of geometries that can be defined in terms of algorithms, it requires the use of parametric software. Branko Kolarevic uses the example of an international London railway terminal (Waterloo Station) designed by Nicholas Grimshaw and Partners as a demonstration of parametric design.8 To roof the terminal, 36 three-pin bow-string arches were used, all differing in dimensions and parameters but similar in form. The angle of hinge points and arches changes slightly for each successive element, and the whole is clad with a continuous surface, providing a complex, multi-arched form. As my examples demonstrate, regardless of whether digital or manual techniques are used, whether the whole structure is manipulated or only its units, the subject of the transformations – the material – is a passive building element. Designers work with form-seeking and form-generating processes whose rules fit the design problem. Aside from creating good solutions for the initially-stated problem, more forward-looking designs carrying new possibilities come into being. What happens, however, when the elements that make up the structure play an active part in the transformation? When designed – form-generating – transformations spatially order active elements that have their own properties, we are dealing with unpredictable, temporally irreversible, bottom-up processes. Information about the planned object that emerges during the design process no longer describes the external, physical appearance (phenotype). Designers use genetic algorithms to design internal qualities and logics of operation: the genotype, to use another biological term. The aim is no longer to create a static entity, but to bring to life a working, reacting identity. This organisation, like an open system, reacts dynamically to external influences and continuously adapts to its environment: it is responsive. The use of genetic algorithms in design takes us to the stage preceding materialisation. Provided that in the future we are able to assign intensive qualities10 – such as distribution of forces and material quality – to computer models, we will get build-able structures that adapt to the laws of statics and physics. Let us imagine that we exchange the building units of Corpora for organic elements. With the advance of nanotechnology and the use of computer coding, not only William Gibson’s vision11 – the almost instantaneous rebuilding of Tokyo with the help of nanotechnology after an earthquake – but also responsive spatially manifesting transformations such as Corpora can be realised. This vision of the future is based on the modelling of currently-known biological systems. The transformation of design can take us considerably further than the application of the principles of real, natural, biological processes. Just as virtual space creates the possibility for experiments simulating reality on the one hand and the creation of new realities on the other, a kind of artificial biology can manifest in our physical environment, which – through the utilisation of new, non-natural materials and technologies – can create non-natural organisations.